SOCIAL CIRCLE, Ga. (March 18, 2019) – Do you need hunter education before you head to the woods? You have options! Hunters in need of the Georgia hunter education course can choose to go completely online or attend a classroom course, according to the Georgia Department of Natural Resources’ Wildlife Resources Division. The four available online courses each require a fee (from $9.95 – $24.95) but all are “pass or don’t pay” courses. Fees for these courses are charged by and collected by the independent course developer. The classroom course is free of charge. 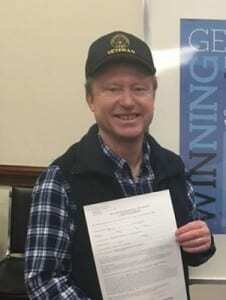 purchases a season hunting license in Georgia. is at least 12 years old and hunts without adult supervision. hunts big game (deer, turkey, bear) on a wildlife management area. purchases a short-term hunting license, i.e. anything less than annual duration (as opposed to a season license). is hunting on his or her own land, or that of his or her parents or legal guardians. For more information, go to https://georgiawildlife.com/hunting/huntereducation or call 770-761-3010. 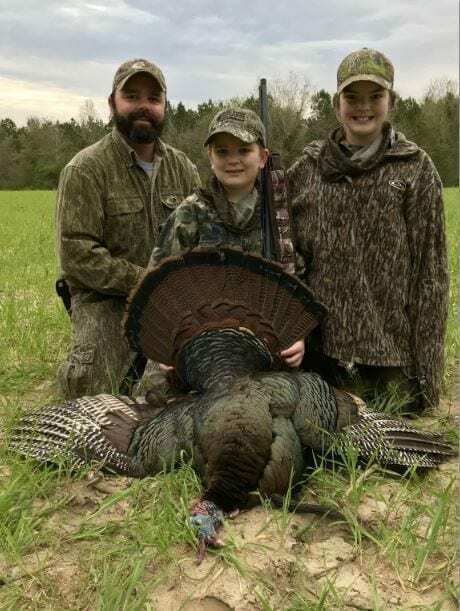 SOCIAL CIRCLE, Ga. (March 18, 2019) – Before you head to the woods this Spring in pursuit of a gobbler or two, the Georgia Department of Natural Resources’ Wildlife Resources Division encourages all hunters to take some time to review important turkey hunting safety tips. Never wear red, white, blue or black clothing while turkey hunting. Red is the color most hunters look for when distinguishing a gobbler’s head from a hen’s blue-colored head, but at times it may appear white or blue. Male turkey feathers covering most of the body are black in appearance. Camouflage should be used to cover everything, including the hunter’s face, hands and firearm. Select a calling position that provides at least a shoulder-width background, such as the base of a tree. Be sure that at least a 180-degree range is visible. Do not stalk a gobbling turkey. Due to their keen eyesight and hearing, the chances of getting close are slim to none. When using a turkey call, the sound and motion may attract the interest of other hunters. Do not move, wave or make turkey-like sounds to alert another hunter to your presence. Instead, identify yourself in a loud voice. Be careful when carrying a harvested turkey from the woods. Do not allow the wings to hang loosely or the head to be displayed in such a way that another hunter may think it is a live bird. If possible, cover the turkey in a blaze orange garment or other material. Although it’s not required, it is suggested that hunters wear blaze orange when moving between a vehicle and a hunting site. When moving between hunting sites, hunters should wear blaze orange on their upper bodies to facilitate their identification by other hunters. For more hunting information, visit www.georgiawildlife.com/hunting/regulations . Next Article » BEFORE TURKEY SEASON BEGINS, DO YOU NEED A HUNTER EDUCATION COURSE? SOCIAL CIRCLE, Ga. (March 18, 2019) – Georgia turkey hunters are ready for the season to open on Saturday, Mar. 23. The 2019 turkey hunting season should be a fair season, similar to 2018, according to the Georgia Department of Natural Resources’ Wildlife Resources Division. With a bag limit of three gobblers per season, hunters have from Mar. 23 through May 15 – one of the longest seasons in the nation – to harvest their bird(s). What should hunters expect this spring? The Ridge and Valley, Piedmont and Lower Coastal Plain should have the best success based on 2017 reproduction information. The Blue Ridge region had a poor 2017 reproductive season, but saw a significant jump in 2018, so there may be a lot of young birds in the woods. The Upper Coastal Plain saw reproduction below their five-year average for the past two years, so numbers in that part of the state may be down. Cedar Creek and Cedar Creek-Little River WMA Hunters, take note! The 2019 turkey season will run April 6-May 15 on these properties. This is two weeks later than the statewide opening date. This difference is due to ongoing research between the University of Georgia and WRD, who are investigating the timing of hunting pressure and its effects on gobbler behavior and reproductive success. Through this research, biologists and others hope to gain insight to the reasons for an apparent population decline in order to help improve turkey populations and hunter success at Cedar Creek WMA and statewide. Georgia Game Check: All turkey hunters must report their harvest using Georgia Game Check. Turkeys can be reported on the Outdoors GA app (www.georgiawildlife.com/outdoors-ga-app), which now works whether you have cell service or not, at gooutdoorsgeorgia.com, or by calling 1-800-366-2661. App users, if you have not used the app since deer season or before, make sure you have the latest version. More information at www.georgiawildlife.com/HarvestRecordGeorgiaGameCheck. Hunters age 16 years or older (including those accompanying youth or others) will need a hunting license and a big game license, unless hunting on their own private land. Get your license at www.gooutdoorsgeorgia.com, at a retail license vendor or by phone at 1-800-366-2661. With many pursuing wild turkeys on private land, hunters are reminded to obtain landowner permission before hunting. The restoration of the wild turkey is one of Georgia’s great conservation success stories. Currently, the bird population hovers around 300,000 statewide, but as recently as 1973, the wild turkey population was as low as 17,000. Intensive restoration efforts, such as the restocking of wild birds and establishment of biologically sound hunting seasons facilitated the recovery of wild turkeys in every county. This successful effort resulted from cooperative partnerships between private landowners, hunters, conservation organizations like the National Wild Turkey Federation, and the Wildlife Resources Division. The Georgia Chapter of the National Wild Turkey Federation has donated more than $4,000,000 since 1985 for projects that benefit wild turkey and other wildlife. The NWTF works in partnership with the Wildlife Resources Division and other land management agencies on habitat enhancement, hunter access, wild turkey research and education. The NWTF has a vital initiative called “Save the Habitat, Save the Hunt,” focused on habitat management, hunter access and hunter recruitment. Photos courtesy of Brian Vickery. 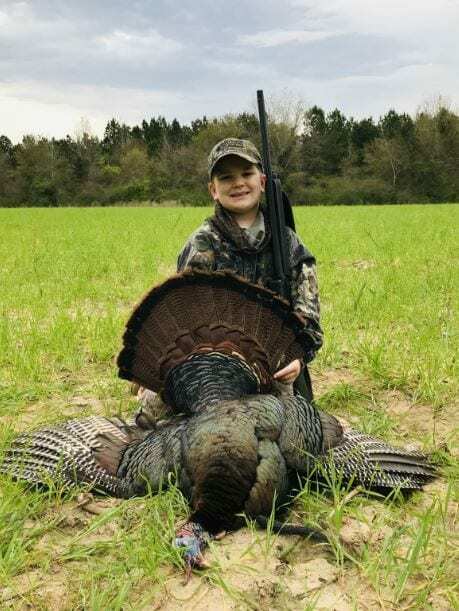 After watching his older sister have two successful seasons, 7 year-old Luke is able to take his first bird during the special opportunity youth turkey hunting season. The Huffington Post, it’s reputation for Left-wing accuracy based on its cunningly creative polling techniques, predictions and prognostications, now sullied and left in tatters after Trumps victory, is embarked on what one might call a Corporate Retreat event, in fact a bus tour of “Middle America,” visiting twenty-three “Hick” states, so their young staffers can observe and decide what went wrong with their message and what they can do to correct it. The “yokels” must be convinced they were wrong; that Trump is a buffoon, not to be trusted and because of them (the yokels) America passed its last best chance, with Hillary, to be an equal among equals. It means of course, not just observing, but actually associating face to face, with those country “rubes,” sitting at their dirty lunch counters, drinking their oily coffee, tasting their greasy hamburgers and occasionally being urged to enjoy an RC Cola and a MoonPie. Perhaps the Huffington Post crew should start their faux American educational tour at Frostbite Falls, Mn.. These self-important “reporters,” not limited to Huff-Po alone of course, come in at least two identifiable categories. 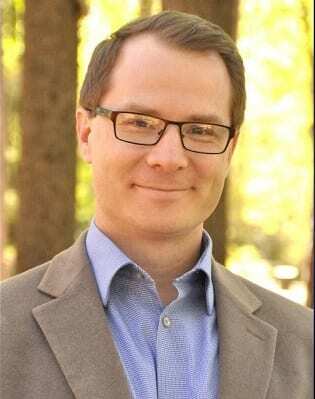 The ‘shallow reporter’ who immediately writes and publishes the first thing they hear, even if it’s from an anonymous source (rumor), a ‘reliable’ source (an official rumor), an open source (somebody else’s rumor), or no source at all, so long as it advances the Leftists agenda of destroying conservatism. If it’s anti-Trump or anti-Republicans, more the better, even if it has to be manufactured (fake) rumors. less than a passing acquaintance with fact checking but, facts be damned, if it destroys someone then it must be used and the facts can be sorted out later to fit the narrative. The second category is the establishments all knowing reporter, usually a Cable News type, whose suave voices, calm demeanor and in your eye commentary, demands belief. Sheppard Smith of Fox News fits this category, as does CNN’s Wolf Blitzer (Wolfgang Lightening), Anderson Cooper and Rachael Madcow. Every network has them. Most are laughable in the display of their hysterical anti-Trump dysfunction, visible for all to see; but, they don’t see. I’ve long suspected Sheppard Smith was a crypto-lefty, certainly a #NeverTrumper, but he was always clever enough to appear “fair and balanced“ until a Trump story comes up and then all pretense is swept aside. Wolf Blitzer gets breathless when trying to connivence us that some CNN manufactured story of Trumps association with the evil Russians has a hidden element in it that will make it true. Their viewership numbers, by the way, have dropped below the Rocky and Bullwinkle levels on MeTv. That’s why Frostbite Falls, Mn. should be on their bus tour. I’m getting weary of this constant fake news reporting that pounds at us daily. So are others apparently, which would explain the dropping viewership numbers of most major cable news channels. For me, the OAN network is replacing Fox news as my go to choice but, the Colbert Report will never get my vote. Like the fake news reporters, he’s starting to believe his own copy and that’s dangerous. Remember, freedom is the goal, the Constitution is the way. Now, y’all git out tha’r and help educate them tha’r reporters. Constitutional conservative GA Senator and Candidate for GA Governor Hunter Hill came on the show this morning to discuss why he is running for Governor. Hill has been a member of the GA Senate since 2012 after returning home from his third tour of duty in Afghanistan. 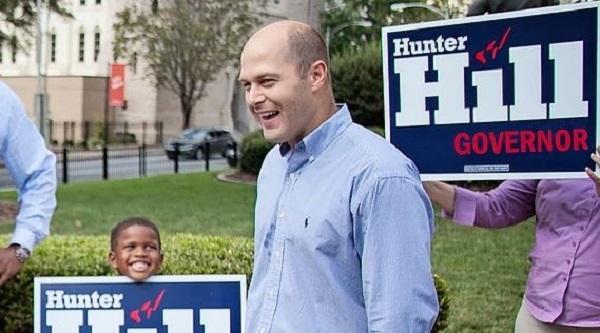 During this interview Hunter Hill talks about the importance of the core competencies that he would focus on in the state if elected as Governor. These being public safety, education, and transportation. Hill made the statement that the current restrictions on the education system is “stifling leadership” not just within the classroom but even into the administration within the schools. Hear all these details and more in this interview.